In the bottom of the seventh inning of last night’s NLCS Game 1, with the Dodgers leading 4-2, Justin Turner singled through the left side and Chris Woodward, the Dodgers’ third-base coach, waved Charlie Culberson around, setting up a play at the plate. What happened next hardly decided the game, but it was almost certainly the game’s most memorable moment: Kyle Schwarber fired a near-perfect throw home, and catcher Wilson Contreras made a clean catch; Culberson seemed to over-slide the plate; the umpire made no ruling on the initial contact between Contreras and Culberson, but when Contreras lumbered over and applied the tag, Culberson was called out. Unless the catcher is in possession of the ball, the catcher cannot block the pathway of the runner as he is attempting to score. If, in the judgment of the umpire, the catcher without possession of the ball blocks the pathway of the runner, the umpire shall call or signal the runner safe. Not withstanding the above, it shall not be considered a violation of this Rule 6.01(i)(2)(Rule 7.13(2)) if the catcher blocks the pathway of the runner in a legitimate attempt to field the throw (e.g., in reaction to the direction, trajectory or the hop of the incoming throw, or in reaction to a throw that originates from a pitcher or drawn-in infielder). In addition, a catcher without possession of the ball shall not be adjudged to violate this Rule 6.01(i)(2) (Rule7.13(2)) if the runner could have avoided the collision with the catcher (or other player covering home plate) by sliding. 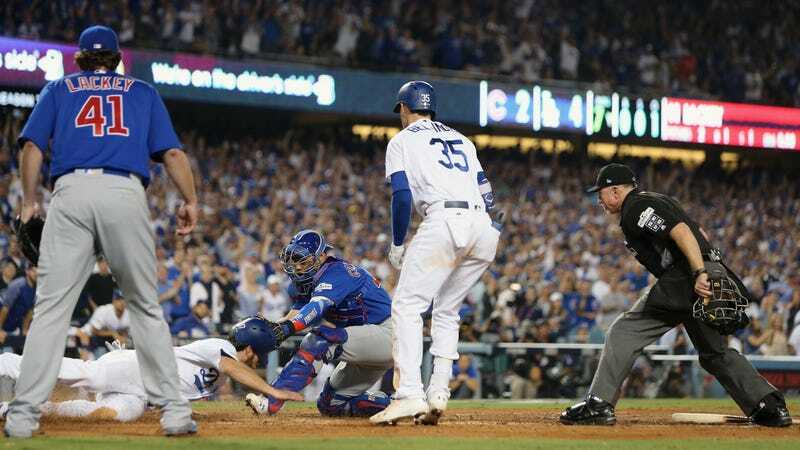 Viewed from different angles—notably, the slow-motion shot from the first-base side of home plate—it becomes apparent that Culberson’s slide missed the plate, despite a good-faith effort, because Contreras’s left leg was completely blocking his path. On the replay, Culberson’s arm goes out and gets hooked around Contreras’s lower leg—without Inspector Gadget arms, there’s no way for him to touch home plate. The question, then, is whether Contreras was in that position because of a “legitimate attempt to field the throw,” which would rule out a violation and make Culberson out. To me, this seems pretty straightforward: the trajectory of the ball did pull Contreras to his left, but is the flaring out of that leg a necessary movement for the purpose of catching the ball? Or is it a necessary movement for catching the ball in position to apply the tag? I think it’s the latter—if all Contreras is trying to do is make a legitimate attempt to catch the ball, he can stand up, he can dive to his left, he can flare just his glove hand over to that side. Any of those movements would make it vastly harder for him to apply the tag, but that’s supposed to be the point—in baseball, catching a throw and applying a tag are done in the same movement, but they aren’t the same act, and the rule doesn’t have anything to say about applying the tag.. That leg is not part of catching the ball; it’s part of catching the ball in a stable crouch, and in order to form a wide base upon which to pivot left without toppling over backwards (also, I think Contreras was trying to block the plate). This, apparently, was also how the umpires saw it. That, of course, did not sit well with Cubs manager Joe Maddon, who argued the call, and was ejected. I, from day one, have totally disagreed with the content of that rule. I think it’s wrong. I think anybody that’s played major league or even minor league baseball would agree with me 100 percent on that. That was a beautifully done major league play all the way around, that gets interpreted kind of like, it’s tantamount to the soda tax in Chicago, for me. Contreras reportedly said “I think we need to go to Walmart, get some toys and then play,” so clearly the Cubs are handling this like grownups.